Bell, Book and Camera Productions has been making educational products for years. From lesson plans to educational videos, these products have enhanced classrooms all over the country and brought subjects to life. All of our products are sold on Teachers Pay Teachers. Check out our products to the left or visit our store. Popular items are found below. This activity, perfect for a world history class at the middle school or high school level is our best seller. The activity imagines Napoleon tweeting up a storm during his lifetime. Students have to identify the "Tweet" with the event and date in Napoleon's life. Included is also a quiz to assess learning after the activity. 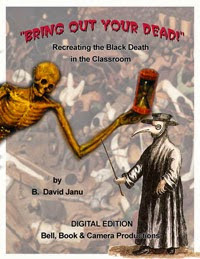 This activity provides several days of study on the Black Death in Europe. It includes a reading, lecture, and instructions on how to "Bring the Black Death to Life" using theatrical make-up. Includes many anticipatory sets including the use of images and the song, "Scarborough Faire." Eleven pages of detailed lecture notes that address all aspects of the Black Death including some bio-history, modes of transmission, causes and effects, remedies people used and the bubonic plague in today's world. Step by step illustrated instructions on how to use makeup to give a student the black death. Visit our website for detailed instructions on how to make buboes. A video instruction on how to apply the makeup is also available.